Outdoor fireplaces and fire pits are a wonderful addition to any backyard patio area. The warmth they provide allow people to enjoy the outdoors even during the cold months, while during summer, they can enjoy a fireplace without heating up the inside of the house. Fireplaces and pits have the ability to enhance your backyard area, make the outdoor area feel as cozy as the inside of your home and add a romantic feeling to your backyard patio area. There are many kinds of outdoor fireplaces to choose from. The traditional outdoor fireplace looks just like an indoor fireplace. They are usually shaped rectangular but their designs vary. Modern fireplaces are highly versatile and you are sure to find one that you like among the various designs, shapes and sizes. They use either wood or gas. If you prefer an outdoor fire pit, not a problem. They, too, come in many different styles. 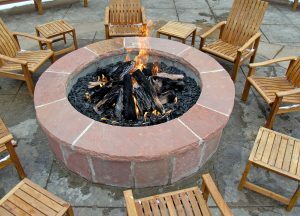 Gas fire pits, wood fire pits, permanent fire pits, brick fire pits and stone fire pits, there are many great options. They are most commonly built out of granite, copper and brick. Some even come with fire glass adds some extra elegance to your pit. Outdoor fireplaces or outdoor fire pits, the choice is yours. When choosing an outdoor fireplace or fire pit, keep in mind the size and design you desire. The fireplace or fire pit you end up getting should add to the beauty of your backyard or patio as this can also increase the appeal to buyers should you ever decide to sell your home. Choosing the right location for your fireplace is extremely important in order to prevent fires and accidents. They always have to be built on a level ground and away from barns, sheds and garages. Be advised that the place where the fireplace will be built should not have any underground wires and cables. With all of this in mind, it’s best to have your outdoor fireplace or fire pit professionally installed by a company that installs outdoor fireplaces on a regular basis. That way you are getting exactly what you want while ensuring the safety of your family.